Aquatic life can suffer when high concentrations of dissolved salts enter freshwater ecosystems, a process known as salinization. An international, multi-institutional team of researchers that includes a Virginia Tech graduate student recommends ways that humans can protect freshwater from salts in an article Friday (Feb. 26) in the journal Science. "We've written the paper as a call to action, or at least a call to awareness, and we've tried to describe what we think will be an effective path forward," said Tony Timpano of Herndon, Virginia, a doctoral student in the Department of Forest Resources and Environmental Conservation in the College of Natural Resources and Environment. Increased salinization in freshwaters is an issue that hasn't gotten much attention in terms of science policy, according to Timpano. 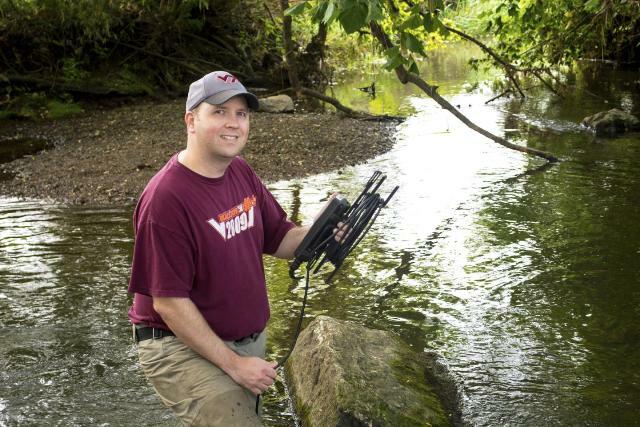 Since 2008, when he began a master's in environmental sciences and engineering at Virginia Tech, the focus of Timpano's research has been changes in biodiversity of the aquatic insect community as salinity increases in Appalachian freshwater streams. "I've been focusing on trying to understand the pattern of salinization through time because it does change seasonally, and then trying to understand that related to the diversity of stream insect communities," Timpano said. "These insect communities are currently being used as a bio-indicator of water body health for Clean Water Act compliance." Now in his third year as a doctoral student, and a member of the Interfaces of Global Change interdisciplinary graduate education program, Timpano is hard at work on his dissertation but says he plans to continue working with the group of co-authors on this recent paper--a multi-disciplinary global advisory group to the Society of Environmental Toxicology and Chemistry. "I think one of the most important things about our recommendation isn't so much the details of the science as it is fostering the cooperation between the scientists and the other stakeholders," Timpano said. "Getting all those stakeholders to the table and communicating that science to those stakeholders is critically important for any biodiversity protection effort to work." "Tony has had a unique opportunity to meet and work with leading international scientists who are advancing our knowledge of freshwater salinization," said Stephen Schoenholtz, a professor in the Department of Forest Resources and Environmental Conservation in the College of Natural Resources and Environment and director of the Virginia Water Resources Research Center. "Collaborating with these scientists to publish a synthesis paper on this topic has been a wonderful experience for Tony."